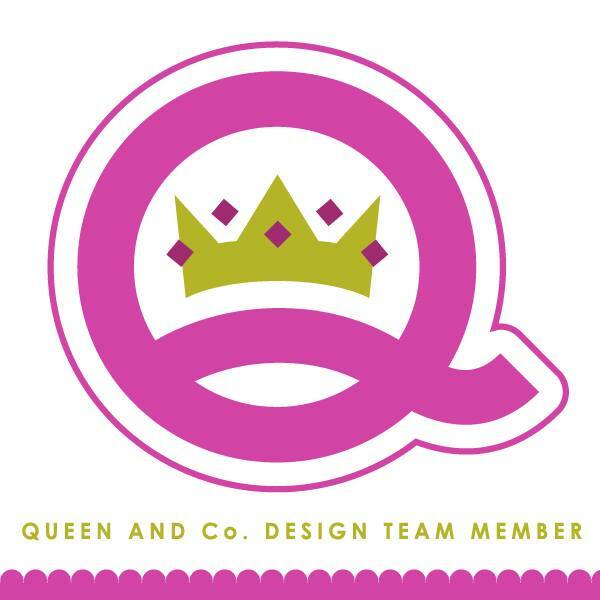 kim watson ★ design ★ papercraft: Scrapbooking Holidays & Celebrations + Giveaway!!! Scrapbooking Holidays & Celebrations + Giveaway!!! As promised, I’m back with yet another fabulous special issue GIVEAWAY from Creating Keepsakes. 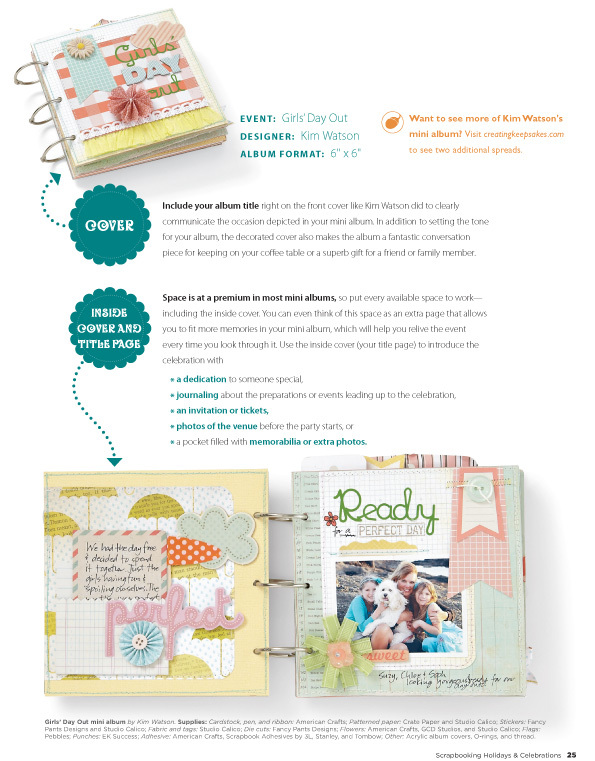 This amazing mag focuses on Scrapbooking Holidays & Celebrations! So whether your holidays and celebrations are casual get-together or formal events, this special issue from Creating Keepsakes magazine is sure to be a trusted source of scrapbooking inspiration! The gallery of 50 outstanding ideas is a quick source of scrapliftable layouts, and you’ll also discover ways to make your relationships shine on your scrapbook pages, photo-taking tips to catch meaningful moments and details of your celebrations, and journaling ideas to capture the points of view of your loved ones. Learn ways to create easy holiday accents and even ideas for storing your holiday-themed supplies. This is one of the projects I created for the issue. A mini album called 'Girls Day out' capturing a fab, fun day I spent with Suzy & her girls when I was in LA in Jan earlier this year! Want to see a bit more of the contents...? Check out CK's sneak peak. 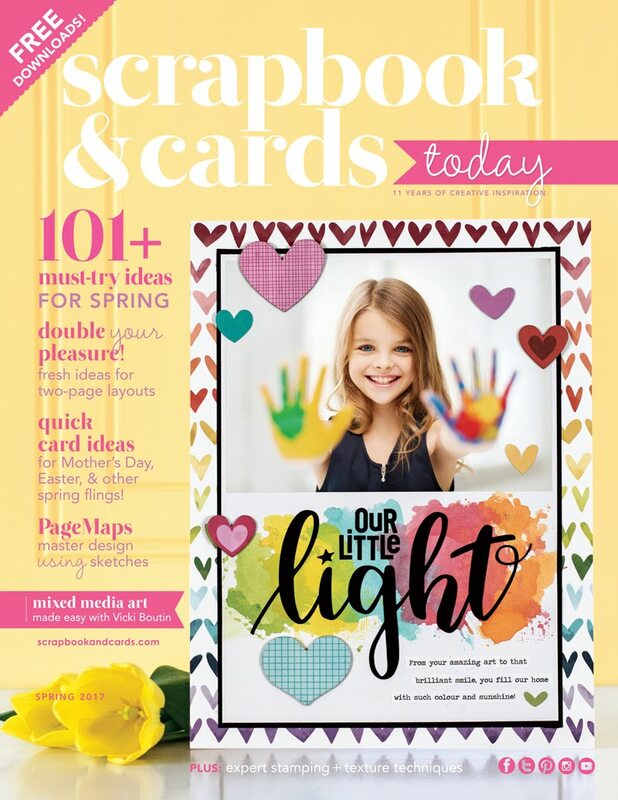 Creating Keepsakes has generously given me a copy of this awesome issue, Scrapbooking Holidays & Celebrations, to give away to one of my blog readers. All you have to do is leave a comment here AND spread the news of the giveaway via Twitter, Facebook or smoke signal if need be :D, along with your e-mail address so I can contact you. I’ll randomly select a winner on Monday, November 21st, 2011, and post the winner's name here by Wednesday, November 23rd. NB: One entry per person, please! Oh & for for another chance to win, check out the Creating Keepsakes blog. Your blog is interesting, has left a great impression. Thank you for a chance to win this book! I love your work. Your mini book looks awesome. Love your blog! Fabulous mini book! THanks for the chance! I want it!!! thank you for the giveaway! This looks like a really lovely book, would love to add it to my collection. Mayby it`s will be my lucky day? so far it`s great just check on my morning ...it`s my Birthday! Thanks for a chance to win! And, congrats on continuing with CK. I enjoy seeing your layouts! Thanks for the chance to win! I'd love this issue. Congratulations on continuing with CK, too! How cool! Thanks for the chance! Thanks for the giveaway Kim! Looks like a great issue!! And congrats on another term on the CK Dream Team!! Oh wow - another great CK book I'd love to own!! Thanks for the opportunity to win Kim :0) ALSO a HUGE CONGRATULATIONS on another year as a CK dream team member!!! I am thrilled and totally over the moon with the cow that you made it on the list again and that I have another year ahead of seeing your gorgeous LO's in the mag, I literally page through as soon as I get mine in the mail to spot your pages and I am NEVER disappointed!!! You ROCK and so totally deserve it!!! Thanks for this chance, Kim. I would love to win this! lbruynell at comcast dot net. Would love to settle in with this and a cup of hot chocolate!!! Thanks for the chance. This looks like a good one! Thanks Kim! This looks like an awesome issue full of great inspiration. Thanks for the chance to win, Kim! Thanks for the chance to win this interesting looking mag! I like your style. Thanks for this chance to win - I have many other CK special holiday issues from prior years and they are always packed beauty!! Win...did someone say win!! I am in! awesome! thanks for the opportunity! yay! Generous prize....thank you for the chance to win it. Love the mini you created. The issue looks fantastic...thanks for the chance to win! I love our album! Such a realistic idea with the rings for those who don't have a binding machine. Very cute! Happy Thanksgiving. Wow! Just seeing your album makes me happy! It's so great that you made an album just for Suzy and her girls!! I hope I'm not to late to post. Thanks for a chance to win. Sounds like a fabulous issue. Thanks for the chance to win. PS. Love your mini book! Hoping I'm still in time.... :) It's still the right day in my time zone! Thanks Kim for the chance for the publication! BTW, I love your blog!